With over 37 years in the industry, no repair is uncharted grounds for us, we have seen and fixed it all, from snapped technics 1210 tone arms to faulty Pioneer CDJ's. 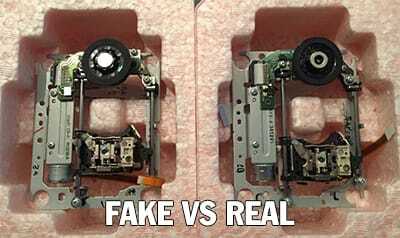 <<< This is a Real vs Fake comparison between 2 CDJ Mechanisms. It's very hard to spot the difference. The main difference being the customer who bought the fake (being passed off as Genuine on an online auction site) did not work. The only way to ensure your gear works as it was intended to is to use genuine parts. We Deal with all major Professional brands within the industry, have a problem contact us now! From Martin intelligent lighting to Kam star cluster lasers, we can fix any problems or faults. 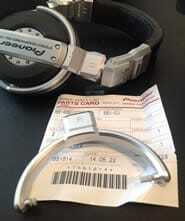 We repair DJ headphones, if your HDJ headband has snapped we can help. PAT Testing available in store now. We can PAT test all your DJ equipment in store insuring you have no problems with gigs needing PAT certification. Preventative Maintenance on site callouts are available for customers with fixed installations. Can't bring in the faulty equipment, we will send the engineer to you! We already deal with service contracts all over Scotland from the Highlands to the borders. We offer Technics turntable servicing and repairs, in house. From preventative maintenance to a replacement technics 1210 tone arm. We can supply a full range of official technics DJ spare parts, from a missing technics 1210 foot to new a 1200 target light. Have a Turntable you need repaired? Contact our Edinburgh DJ repair centre. We are official Dealers for Numark and our DJ repair department has years of experience repairing Numark CD players and Numark Mixer repairs. We can also provide insurance quotations for damaged or stolen DJ equipment and lighting. Call 0131 556 1300 Now! The good news is that we have been servicing and repairing DJ equipment for over 37 years with technicians with combined experience to undertake any task. We strive to provide a fair and honest cost along with our top technical expertise in the DJ equipment repair.